United Nations Conference on Trade and Development (UNCTAD) published its World Investment Report for 2012 which outlined that FDI in 2011 exceeded pre-economic crisis levels. 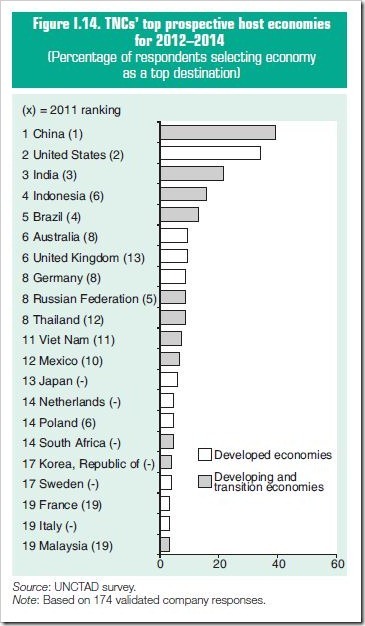 More importantly, the report ranked India as the 3rd most preferred economy for FDI after China and US. The comprehensive study surveyed more than 179 companies and it emerged that the top 3 most favorable hosts for FDI remained constant in 2011 as compared to the previous year. India’s rank remained unchanged at 3rd overall and 2nd amongst all Developing and Transition Economies, only after China. India is expected to remain in that position for next 3 years. 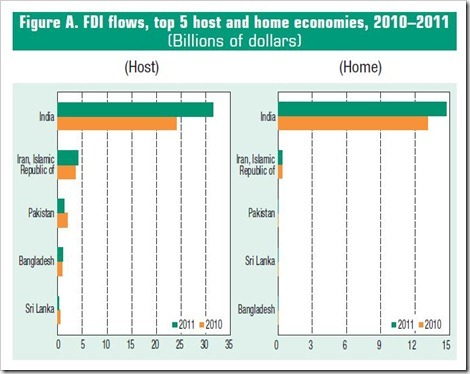 In South Asia, India emerged as the leading economy attracting inflows that accounted for more than 20% of all FDI in the region. This surge contributed to stronger inflows into South Asia after a stop-gap slide during the 2009-10 economic downturn. The report however did not ignore the play of political influence and mentioned that ‘political risks and obstacles to FDI’ are the challenges that countries like India are facing. Foreign companies including the world’s largest retailer Walmart are sitting on the fence waiting for the government to come to a consensus on allowing FDI in retail. In 2011, PM Manmohan Singh had announced that India Inc would be open to 51% FDI in retail. This announcement was met with opposition and has since been stalled as a certain section of politicians mull over the possible effects on small time kirana store owners and businessmen. Just this week, retail stocks including Koutons Retail, Provogue, Shoppers Stop and V2 Retail spiked as speculations emerged that the government would formally give the big thumbs up for FDI in retail later this month. India’s top ranking in this report comes at the back of March 2012 which witnessed highest ever FDI inflows of $8.1 billion as compared to $1.07 billion in March 2011.The top sectors at the receiving end of FDI as services, telecom, construction and power amongst others. The announcement of a $7.2 billion deal between RIL and BP was made in February 2012. The World Investment Report 2012 also pointed out that India had the highest contribution to FDI outflows among all other Least Developed Economies (LDI), ranking ahead of China and South Africa. Total FDI outflows from Indian amounted to about $14.8 billion. ET recently discussed how Indian companies are digging out business opportunities in Latin America to tap into overseas domestic markets. The likes of Godrej, Jindal Steel, Shree Renuka Sugars, Infosys, Wipro, Mahindra & Mahindra, Suzlon and TCS have presence in countries like Argentina, Peru, Brazil, Mexico, Chile, Columbia and other Latin American countries. It is believed that apart from large domestic markets, proximity to North America could also be one of the driving factors behind India Inc favoring Latin America as a business destination. Despite the Vodafone’s recent Rs. 11,000 crore tax evasion tiff with the government, despite the delay in policies around FDI in retail and despite criticism of bureaucratic hurdles by a certain steel magnate based in UK, India Inc still remains one of the top destinations for FDI. If all goes according to highlighted trends in the World Investment Report 2012, India Inc could be set for a flurry of economic activity with FDI pumping vitals into the dollar starved economy. Great site latest and happening topics. Found one more site which has lot <a href="http://www.financialrevision.com /” target="_blank"> http://www.financialrevision.com /<a>go visit this. One more point I want to make regarding FDI in multibrand retail. The forigners like Walmart etc are not aware of the risks they are taking. They should notice who are opposing the entry. Parties headed by stubborn people like Mamta in Bengal, Mayawati in UP, Vaiko in Tamilnadu are opposing. These parties go to any extent to stop the operations. Even if MMS gets the bill passed in parliament by force (like the Nuclear Non Proliferation treaty in last govt), the parties will fall to any low. They may resort to arson. They may ransack the stores in nights to casue disruptions. Even staff can be harrassed. This kind of situation where the Forign retailers decide to pull out of India is more dangerous to India than not having them in first place. The reputation of India will take a big beating once even a single big name pulls out. Like what happened to Tata Nano in WB. Gujarat took advantage. The same can happen on international scale. If some mafia scares some of them out, some other nations will take advantage. Even to think like this is disgusting but what to do? We have to do risk assessment. The report is a misleading one that India is a preferred destination. If you take out the BP investment of 7.2 bil USD, the other amount is o.9 billion compared to 1.07 bil USD in previous year. The reasons for the decline are obvious for every one to see. Govt is doing witch hunt in cases like Vodafone scaring away genuine investors. GAAR is another issue due to which FIIs like Maquire have closed operations in India. Mittal is waiting for the last 6 years to invest in India while the govt is sleeping. Posco is also not confident that it has crossed all hurdles. Companies which invested in power sector in UMPPs are now cursing themselves to have committed 4 bil USD for each UMPP. Jindals are suffering due to blanket ban on mining. Its like arresting the whole village for the misdeeds of a single person. Govt can hunt down the illegal miners like Karnataka ministers mafia. But they are given face saving by blanket ban and made Jindals and hundreds of small pig iron manufacturers in Karnataka suffer. Recently there is a rumor that NRI remittances will be taxed. Once they were made to realize that they are cutting the branch on which they are sitting, they took the proposal back. I think the whole set up of Ministries, those who are advisers to the ministers, the so called planning commissions and all those responsible for decisions on policy matters have to go. Even a single rotten head will hamper pragmatic policy. They should never be allowed to hold any public office. Then we can see some real interest in investments in India.